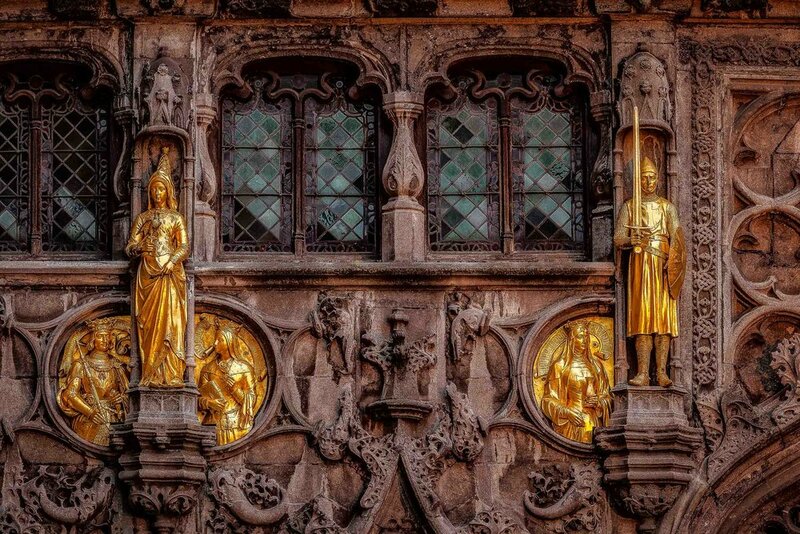 Gold colored figures decorate the facade of this building in Bruges, Belgium. Bruges (i.e., Brugge in Dutch) is a most beautiful and historically fascinating city in the north of Belgium. Situated in West Flanders, the Dutch speaking northwestern region of the country, Bruges was a great place for me to unwind towards the end of a fairly grueling six week photography trip. I love Bruges. This beautiful, Flemish medieval city was once one of the world’s great trading centers. Today it offers the enthusiastic photographer a wealth of opportunities to explore and photograph. The above photo features guilt statues and some of the unique windows on the facade of the Basilica Of The Holy Blood. Dating back to the 12th century this minor basilica was built as a chapel for the Count of Flanders. I wandered past this structure, at dusk, and was immediately taken with the glow of the golden statues in the fading light. I set up my tripod and photographed a series of details from the facade, including this one. 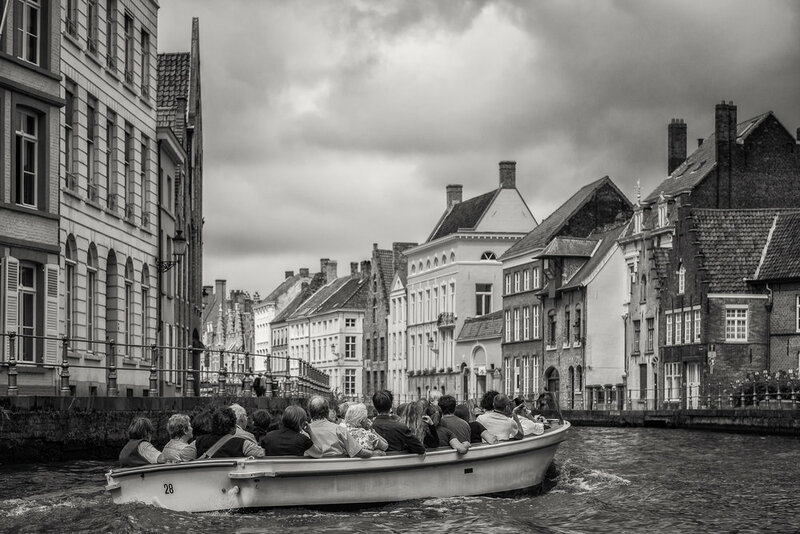 A group of tourists taking a small boat tour on the canal in Bruges (i.e., Brugge), Belgium. I particularly enjoyed exploring the city's backstreets and squares around the end of the day and into the evening. Actually, together with St. Petersburg and Salzburg, Bruges was one of the cities I'd most looked forward to visiting. And, just like those other two famous cities, I was most impressed with my visit to Bruges. While Bruges is quite a large city to explore, only around 20,000 people live within the historic old town centre. Just like St. Petersburg, Bruges is often referred to as the Venice of the North. A major trading and commercial centre, in years gone by, I really enjoyed taking a small boat tour along some of the city's canals. Photographing from the waterline provides an interesting perspective on much of the town's splendid architecture. I made sure I was first on the boat so as to secure a seat that offered the optimal position for photographing in a variety of directions. Brightly colored flowers on a summer's day by the canal in Bruges (i.e., Brugge) Belgium. I made this image at days end, just before darkness descended, on one of Bruges lovely canals. I like the calmness and quiet around this time of day and I feel this image evokes some of the history and a slice of the character of this beautiful city in northern Belgium. The old city of Bruges, a UNESCO World Heritage Site, was designated as the European Capital of Culture in 2002. It's a credit to civic leaders and the general population that the authenticity of this unique city has been retained. While there is local traffic trough parts of the old town, it’s possible to wander many of its narrow cobbled streets in relative calm. What's more, while the major museums and churches are well worth visiting, you really don't have to walk far to get away from the otherwise hectic and crowded tourist trail. A statue on top of the tomb of Charles the Bold in the Church Of Our Lady in Bruges, Belgium. There’s so much to see in Bruges. I photographed this statue atop the tomb of Charles the Bold in the Church of Our Lady. It’s a beautiful church and includes a variety of wonderful artworks including a white marble sculpture of the Madonna and Child created by Michelangelo around 1504. To photograph the statue on top of the tomb of Charles the Bold I lowered my camera so that it was parallel with the statue and then zoomed in to 73 mm to begin to isolate the statue from it's surroundings. I employed an aperture of f/5.6 to produce a relatively shallow depth of field which further separate the statue from it's surroundings. A spectacularly beautiful church organ in the Church Of Our Lady in Bruges, Belgium. The above image was made inside the Church Of Our Lady in Bruges. This is where you can see the Carrara marble Madonna and Child sculpture by Michelangelo. A Pipe organ produces a sound that is ideally suited to the cavernous interior of this spectacular church. As you can see the pipe organ only accentuated the grandeur of the environment in which it was housed. Compositionally the image is divided between warm and cool colors; textured and smooth surfaces; and luminous highlights shaped by deep shadows. The cylindrical shapes in the pipes themselves are visually supported by the shapes of the columns and beams that surround them. I remember my time in Bruges with great fondness and eagerly look forward to my next visit when I plan to spend a week or more exploring as many little nooks and crannies as I can. There’s a lot to see in Bruges and not all of it is within those few highly touristed blocks where most folks spend their time.